I should start by saying I received an Advanced Reader Copy of Vengeance Road through the Giveaway Section on Goodreads for an honest review. Sadly I have to say I couldn't finish the book. I feel a little bad about it too because so many people who have read this enjoyed it, and I just couldn't seem to get past the first few chapters. I picked it up on several occasions thinking maybe it was just the reading slump I was in, but the book never held my attention for long. I just couldn't get past the dialect in the book. I tried to truck along, hoping it would grow on me, that the story would pull me in to the point I no longer noticed the very cowboy way Kate talked, but it never really did. The book synopsis, as well as the gorgeous cover, are what pulled me in: a strong female main character, out to avenge her father's death, only to discover some dark family secret. So it was a Western and I don't generally pick those up, it sounded pretty good, I was interested. But then there was the dialect used as Kate told the story of what happened to her family, the book is told through Kate's point of view. It wasn't just the voice of the main character, though. That was just the first thing that I couldn't get behind. Nothing in the first few chapters hooked me, had me sucked into so I didn't want to the book down. So after I set it aside for the fourth time, I called it. 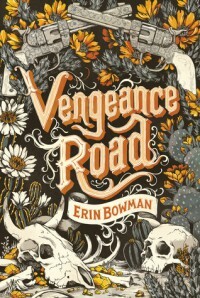 I was a little bummed to do so, Vengeance Road has gotten some pretty awesome reviews. So, is it a bad book? Honestly, I don't know and that is the reason for me not giving this book any stars. I didn't make it far enough into the plot to give it a far shake of whether it was good or bad. What I know is it wasn't my cup of tea, but that's me. Probably. From what I read it seemed like a Young Adult, maybe even Middle Grade, targeted book. Also to anyone who reads a lot of Westerns might also enjoy it, or just books written around that time period. Like I said, a lot of people have really liked the book. I will never not recommend a book just because I didn't like it. Everyone's tastes are different, and I don't want to take away from someone who could really enjoy this book (or any book). As for my copy of Vengeance Road, it's going to take a take trip to a Little Free Library. I want it to find a good home and someone who will enjoy it, and I know none of my bookstores will buy it due it being an ARC edition. So I couldn't think of a better place for it to go.